Directions Do not use more than directed. Hold stick straight down over affected skin area. 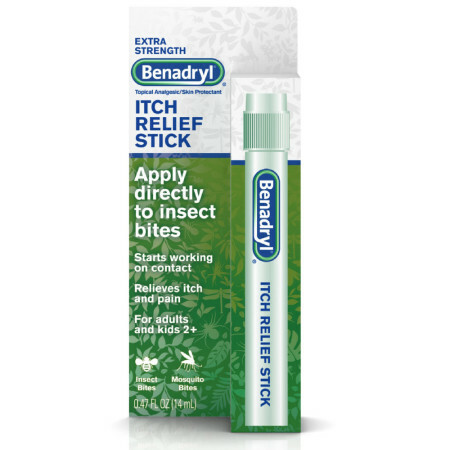 Press tip of stick repeatedly on affected skin area until liquid flows, then dab sparingly. 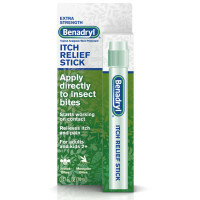 Adults and children 2 years of age and older: apply to affected area not more than 3 to 4 times daily. Children under 2 years of age: ask a doctor. Store at 20 to 25 degrees C (68 to 77 degrees F). 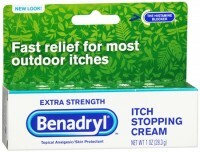 Uses Temporarily relieves pain and itching associated with: insect bites; minor burns; sunburn; minor skin irritations; minor cuts; scrapes; rashes due to poison ivy, poison oak, and poison sumac. Dries the oozing and weeping of poison ivy, poison oak, and poison sumac. Warnings For external use only. Flammable. Keep away from fire or flame. Do not use: on large areas of the body; with any other product containing diphenhydramine, even one taken by mouth. Ask a doctor before use: on chicken pox, on measles. 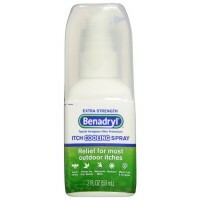 When using this product: avoid contact with eyes. Stop use and ask a doctor if: condition worsens or does not improve within 7 days; symptoms persist for more than 7 days or clear up and occur again within a few days. Keep out of reach of children. If swallowed, get medical help or contact a Poison Control Center right away.